I’ve quit wondering what’s going to happen next around here. I got home a week ago from my 5th big trip this year, and I can’t believe I’ve not blogged a word about it! It’s been a brutal week, and this coming week doesn’t look like it’s going to be any easier, though hopefully it will carry less shock value. I’m to the point I’m half expecting to find out I’ve been an unknowing victim of some peculiar TV reality show – perhaps a twisted version of Survivor blended with Candid Camera, where instead of eating truly gruesome foods, unknowing participants are subjected to a continued onslaught of very stressful events, which blind-side them with their unexpectedness. That said, this post isn’t about my recent trip or my head-shaker of a week – past or coming. Instead, I thought I’d spread a little bit of my weekend sunshine around. As tough as it was for me to change gears when I discovered on Tuesday that I’d totally forgotten registering for a full weekend workshop our knitting guild sponsored this weekend, I’m really glad I didn’t cancel out on it. We had Candace Eisner-Strick come in for 12 hours of classes, and despite the fact that I was battling a migraine, I managed to learn some really great new knitting tricks. Can’t wait to incorporate them in some real knitting! Saturday was a bit frustrating for me. Our class was on Bavarian Traveling Twisted Stitches – or some permutation of those words. For me, the concept was very simple to grasp, and an hour long class would have been more than sufficient on the topic, but there are a lot of different combinations of learning style and experience in a group that large, and Candace wanted to take the time to ensure every student succeeded, so the class was a six-hour venture that left me very glad I’d brought along my Baby Surprise Jacket to knit. I nearly finished the BSJ, and I also made the sampler just below. I’m glad I attended, even if I did feel like it was moving too slowly most of the time. Whereas I’d have had no problem doing this alone, having the day away from the house with this being my primary goal made it actually happen. Considering I’ve had two of the best pattern books for Austrian knitting on my library shelf for at least a couple years, I think I needed the kick in the pants to actually do it! I know – doesn’t really look like much, does it? It’s just one repeat of each of 11 different stitch patterns set one after the other, so they aren’t very distinct for the most part. Today I started working to separate each pattern with a basted contrast strand, and for this post, I put a straight line between each of the designs. We worked the patterns in the round with three identical patterns, so in all, each was worked 3 times. 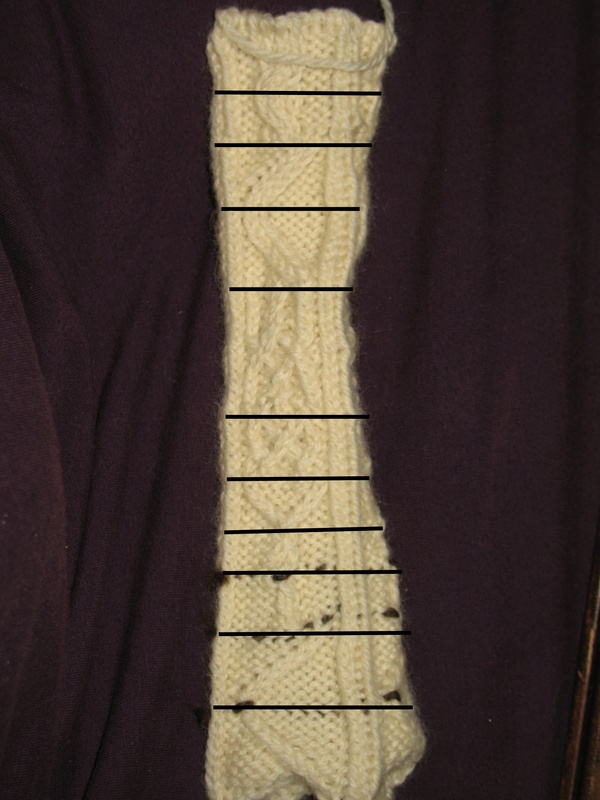 I really wish it was a technique that lent itself to back and forth knitting, so I could see what three repeats looked like worked in succession instead of side by side, but I’ll have to wait until I produce a real project, I suppose. Candace does her twisted stitch knitting in a non-traditional way, twisting the stitches differently for left travelers than right travelers. I want to play with some samples done in the traditional fashion as well, with all the stitches twisted the same way, as apparently the Austrian queen of this technique wasn’t particularly keen on this alternative look. Me being me, I’m going to have to play with it both ways. 😉 I suspect I’ll be happy with both, and I will choose when I wish to use each style. I wouldn’t dare use the modern take on it to knit a sweater for an antique German doll, after all! Sunday there were technically two separate 3-hour workshops, though the edges sort of blended together in the end. The first of these two, titled “Traditions!” was unquestionably my favorite of all, and the best reason for me to have invested a weekend in these workshops. Candace led us through 5 traditional techniques, 3 of which were entirely new to me, and one of which was presented with a tidbit of info that I needed to have known long before now. First we did the Channel Island cast-on. It’s just a dab more fussy than most other cast-ons I’ve used, but not that much slower once I learned how to hold my tongue just right. We used it both as a base for ribbing and as a provisional cast-on later in the day, and although I’m not totally smitten with the provisional use, it looks so gorgeous with ribbing that I’m definitely sold there, and I wonder if I’ll be able to use anything else when I’m ribbing in the future. It’s definitely worth the effort in this application! 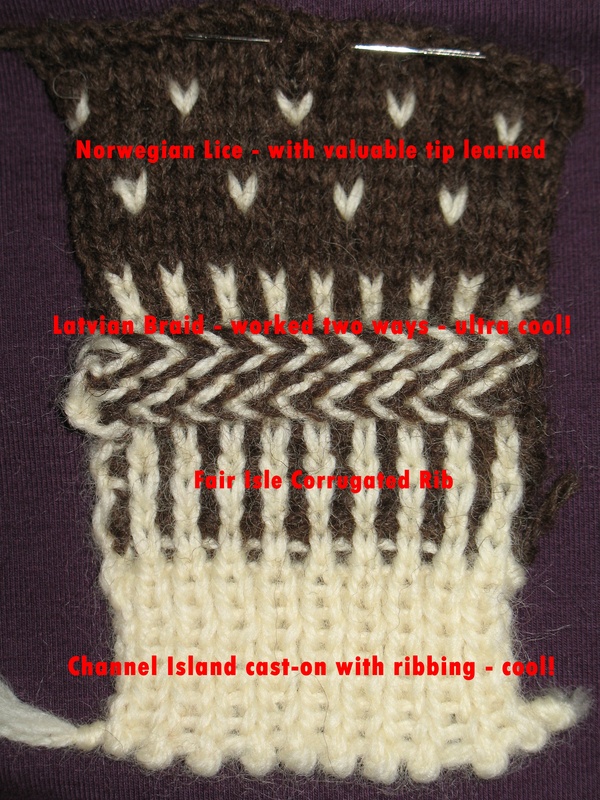 It’s a toss up as to whether I love the Channel Island with ribbing or the Latvian Braid more. Both are pure knitting magic! We were to make one braid, but I decided to double mine, reversing the direction of the second one. I’m definitely going to have to find a good place to use this wonderful little trick in the future! Sunday’s second segment was focused on two of the primary uncommon techniques in Candace’s newest book, Strick-ly Socks. She’s worked out an unusual way to knit the toe (and the heel the same way), which allow them to be started flat. It’s pretty slick, once you get the basics worked out, and I bought her book, figuring I need to try a whole pair out, if nothing else, just for the experience. I’m always game to try something new. 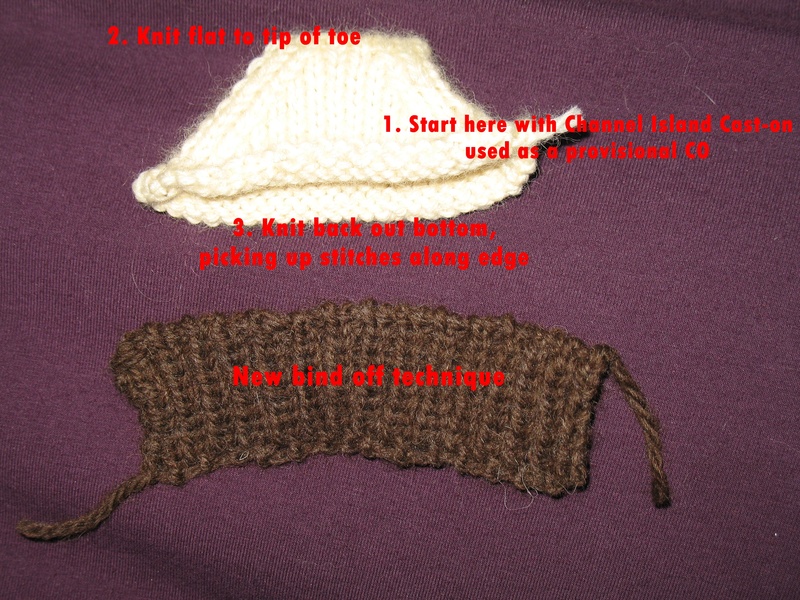 🙂 If you like to knit toe up socks, but you aren’t comfortable with any of the normal starts, don’t give up until you give this one a try, as it’s a totally different way to go.